If you did not read my previous blog.. ENOUGH.. this will make no sense to you. You may want to go backwards and read it first.. I was sent this article later in the evening. I think it is a great and accurate response to the worlds cry for less children. Again read the previous blog first. Matthew 16:25, For whosoever will save his life shall lose it: and whosoever will lose his life for my sake shall find it. Recently I read a phrase that captivated my attention. In his book Caesar and Christ, Will Durant states that one of the reasons for the fall of the Roman Empire was that they sacrificed their civilization for the comforts of sterility. Yes, there are comforts to sterility. No sleepless nights. No sacrifice. Freedom to pursue your career. Time for pleasure. Make more money. Get a bigger house, better car and higher status symbol. But what’s the end result of chosen sterility? Sadness. Loneliness. Emptiness. And eventually the decline of a civilization. Our culture, out of the church and in the church, is rooted in pleasure seeking. We are shallow. We are selfish. We want to do our own thing. But nothing comes of a fruitless vine. It is useless. Good for nothing. It doesn’t provide food or blessing for anyone. This is not what life is all about. Life is sacrifice. In fact, you can’t have life without death. What did Jesus say in John 12: Except a corn of wheat fall into the ground and die, it abideth alone, but if it die, it bringeth forth much fruit. When we live for ourselves, we lose our life. When we lay down our life in daily sacrifice we find it. This is an eternal law. What is the opposite to the comforts of sterility? It would have to be the sacrifices of fertility. Yes, I have to concede that there are sacrifices to fertility. You will have to lay down your own life. You will have sleepless nights. You will have burdens to bear. But oh the joys! Oh the fruitfulness. Oh the rewards. You will reap the fruit of your labor and sacrifice. You will rejoice in godly offspring who will take God’s love and salvation to the nations of the world. You will fill the world with more of God’s light and truth because of the godly “arrows” you are daily sharpening and polishing. Your life will not end in loneliness but you will be surrounded with children and grandchildren. You are also part of building and prospering your nation. Every child you bring into the world is not only one life, but also the beginning of another dynasty. Every child you refuse to bring into the world is not only one life that is denied but also a whole dynasty that is lost to the world and the generations to come! We are unknowingly driving down this road to destruction. The average number of children per family in USA is 1.8. The Moslem people are multiplying at an average of 6.8 per family and are overtaking the world. Islam is the fastest growing religion in the world today without evangelizing. By multiplying only. Multiplying is the secret for taking dominion. We see this principle in the very first words that man ever heard from the mouth of God. We read in Genesis 1:28, God blessed them, and God said unto them, Be fruitful, and multiply, and replenish the earth, and subdue it: and have dominion. We cannot take dominion unless we multiply. It’s just the way it is! If we want to take dominion for the kingdom of God on the earth, we must multiply. If we want our nation to continue too, we have to multiply. When we stop multiplying, we lose ground. We diminish. Eventually we disappear from the horizon. God wants His people who belong to His kingdom to fill the earth with His salvation and glory. Our purpose is not to just hold the fort until Jesus comes, but to be invaders! We are the children of light, invading the darkness with the light of Jesus. We are truth bearers exposing the deceptions of this humanistic age. We are the rivers of the pure water of God’s throne, ministering life and healing to a sick and hurting world. We are dying to ourselves to bring forth much fruit. We are choosing and embracing life instead of death and filling the world with the godly seed. We are not here to retreat, but to subdue and invade. This is what God’s people did when they were in Egypt. They became a threat to the Egyptians because they grew more and mightier than the Egyptians. Are we, the people of God, a threat to the humanists and the enemy’s camp today? We can be if we have the testimony of God’s people in Egypt who were fruitful, and increased abundantly, and multiplied, and waxed exceeding mighty; and the land was filled with them. Exodus 1:7-9, (Psalm 80:8-11). Oh God, I am sorry that I have been deceived. I repent of my selfishness. I repent of holding back the godly seed. Please give me an invading mentality. Help me to see your purposes and vision. Please save me from my selfishness. Amen. I am training and preparing an army of invaders who will fill the land with God’s salvation and truth. ENOUGH!!!!! Now God’s creation is killing God’s creation??? I realize that I have already blogged 2 times today. But I received this in an email and I am so angry that I need to vent this out on here. I am including the article I was sent. Please read the entire article! Christians need to know that the world is on the attack! They are far more concerned about the Earth and whales than they are about “The heritage of the Lord.” Wherever you stand on this issue, you should be afraid of any country where population is treated and thought of in this manner. Where do you think things like Eugenics began? Do you really believe another Hitler could not happen. Do you really believe we are safe from euthenasia. We are not! Reading this article should make everyone of us fall on our faces and cry out to our God to heal our nation and protect our families. At the end of the blog I will post some of God’s responses on this issue. I hope you take some time to let this really sink in. When is a Big Family Too Big? wowOwow.com is a party … disguised as a website. Created, run and written by 16 independent-minded women — including Candice Bergen, Liz Smith, Whoopi Goldberg, Peggy Noonan, Lesley Stahl and more — who have been talking to each other for decades. They now want you to join the conversation. Angelina Jolie recently gave birth to twins, and she and Brad Pitt already have four other children. While many argue one-half a dozen children is more than a handful, one American family would say six is not enough. 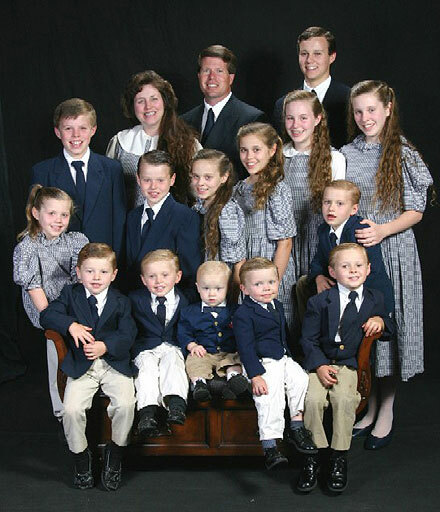 If you haven’t heard their story yet: meet the Duggars. The family recently was ‘grateful’ to announce they are expecting their 18th child in January 2009. What are your thoughts on this? Is there a specific number that crosses the line from happy family to unhealthy nightmare? Or, is it to each their own and none of our business? Whoopi Goldberg: I think it’s to each their own and none of our business. If people want to have 30 kids and can afford it, it’s none of our business. Some people are very wealthy, only have one child and that’s too much for them. Some people have 18 children and they have it together. Who is to judge? Liz Smith: Doesn’t the number of children a family chooses to have fall under the “life, liberty and the pursuit of happiness” clause? Isn’t it a private matter, so long as a family can cope, care for and control in a healthy manner? I wouldn’t think of interfering with this important liberty, though I may have a personal point of view in that I doubt that 18 children are financially or emotionally feasible. And I am gung ho, personally, for Planned Parenthood and serious birth control. I don’t see these as religious or spiritual matters, but as important practicality and welfare issues. As for Brad & Angelina — they are a dazzling exception in their adopting and birthing lots of diverse children “act.” They can afford it, God knows, and their multi-national family is an inspiration. Their money to charity is also a great lesson. But they hardly count in the realistic scheme of things. My only caveat would be — when do Mommy and Daddy know there are too many kids for them to pay acute emotional attention to? Also, I have never understood why nations want to keep the birth rate booming when the world is about to run out of food, water and sustainable climate. But they seem to want to. Natural disasters, wars and pandemics, however, do keep decimating populations and maybe in that horrible way, nature does take care of itself. It just seems to me the ultimate responsibility of adults is to know, realize and make certain that they have a shot at really taking care of the number of children they bring into the world — and, to take some charitable responsibility for the huge numbers of children brought into that same world by other irresponsible people. We need to be worrying everyday about those needy little souls. Joan Ganz Cooney: There’s nothing in the Western world that can be done to stop a family from having 18 children, or 10, or 5, or none. What alarms me is the much larger and more serious question of how large a population the earth can really support. For sure it cannot support a much larger population without straining the world’s resources to the breaking point. We simply don’t have enough water, food, energy and land to handle many more people without irrevocably harming the environment. Humans are taking over lands that used to feed animals in the wild and the population situation in Africa and other places is a terrible threat to the survival of many species. But we humans don’t seem to care about such matters so it’s on to having as many children as each family wants. There are too many of our family members already living lives of bare substance. We need a global effort to reduce population and to develop sustainable energy sources. The future of any human family depends on it. Maybe. Sheila Nevins: Children are necessary to the perpetuation of the species. Not as trinkets and narcissistic expressions of self. During the early formation of America, children were needed to work in the fields, factories, and homes since the early death rate was high and large families would be decreased by natural attrition. In third world countries this may still be true. However in highly industrialized countries that have increasing survival rates, overpopulation is a serious issue and must be seen in an “Alive” scenario in light of scarcity of resources. The human species is consuming natural resources to the detriment of their very being. The fundamentalist religions’ ban on birth control is unconscionable. The one-child policy in China brutally limits individual behavior. Thus the answers to population control fall back on individual responsibility to an over-production of the species. It is hard to see Mother Earth as a force to be reckoned with in daily living, as a living breathing endangered entity. Yet until we see the planet’s dire situation as individual responsibility — starvation, drought, and ultimate extinction seem inevitable as a result of overpopulation. Mary Wells: The media suggests that people are in pain from what the shortages of resources do to them personally. But different countries have different awareness’s and attitudes and there are enlightened people in all countries. But we are running out of everything partly because we heedlessly build more golf courses and swimming pools than necessary, dirty our waters with just about everything, cut down productive trees without anything but selfish or commercial thought, ignore the environment of most animals and care little about their lives. The polar bear and the Orca whale are top of the line in the animal food chain and they are seriously endangered – we tend to think those animals are cute and want them to survive but seldom really think about what they do to balance world resources. We don’t care enough. We aren’t taught to care enough and we don’t teach our children to care enough. So the growth of the number of humans on earth is much greater than most of us focus on and the impact on resources has become misunderstood and a bore to people. I have a friend who will tell us what she and the groups she works with are doing about the essential and practical goal of moving to live on the moon in 20 to 40 years or less. And then on to other planets. They believe earth is “over.” They think it can not handle the vast number of people like us projected to populate earth in 10 years let alone 20 because of growing families. They have been working on a planet world for us to live on for a long time and it will require much more focus from us, much less self interest, but will be a much healthier place to live. So as much I sympathize with people wanting children I think – for children’s sake – the time has come to put the limitations of our earth ahead of anything else and to wake up and join in the movements that are growing to learn how to live a new wide-awake way in a new environment aware that a lot of the disappearing earth wealth is disappearing because of each one of us. We could start with smaller families needing less of the earth’s resources. There are so many references to God’s displeasure with selfishness in the Bible – whatever God turns out to be – we should all be able to show a list of our unselfish choices that saved humans, animals and life of all kinds – and in this world at this time large families are selfish choices that are everybody’s business and everybody’s problem. for he grants sleep to [a] those he loves.